﻿﻿Welcome to my horn studio! 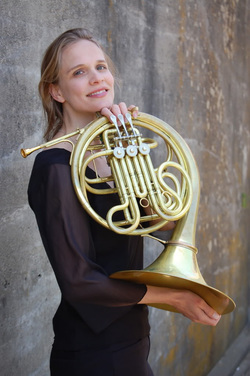 My name is Erika Wilsen, and I am a professional French horn teacher and performer based in Santa Monica, California. I have a Master's in Horn Performance from the University of Michigan and have extensive experience in both performing and teaching. I have taught horn for more than 20 years, as a private instructor, clinician, and coach at numerous universities, youth orchestras, high schools, and middle schools. ﻿Students range from beginners through advanced French horn students and are of all ages and backgrounds. Lessons are 30, 45, or 60 minutes in length, depending on the student's level, experience, and goals. In addition to teaching online, I perform in southern California and teach in Santa Monica and the West LA area. ﻿Students have unique backgrounds, goals and skill-sets. I tailor lessons to the individual student, from true beginners through advanced players. ﻿﻿﻿Take advantage of convenient, professional instruction in your own home or wherever life takes you. Here's what you need for successful online lessons. ﻿﻿﻿I coach French horn and other brass students at middle schools, high schools and youth orchestras. Find out how I can help you and your students through group lessons.